I arrived, kicking and screaming, in this cornfield-framed town in the summer of 2001. Actually, by the time I arrived and settled my two small girls into a new home and life, I had already done all the kicking and screaming and resisting there was to do, back in Michigan. By then, I felt resigned and slightly hopeful. We moved for my husband’s exciting new teaching position at the university, and I thought maybe something unexpected and good would be here for me, too. Within two years, not only had nothing good emerged, but our divorce proceedings had begun. It was hard to not see this place as inherently tainted. Fast -forward six years, though, and I couldn’t be happier with where I live. Sure, some minor things have changed about my town—some of our favorite restaurants, bars and shops have opened up since I moved here—but essentially, the town hasn’t changed. My perspective has. I stopped feeling like I was stuck here against my will and started actively embracing why I would actually choose to be here. I stopped thinking only about geography—where I was on the map—and started to focus on benefits—how the features of this place translate to real benefits in my life. It wasn’t surprised to discover, as I started keeping a Love List, that many of the items on my list are directly tied to the type of town and neighborhood I live in. The town is Midwestern, affordable, and easy to get around in, yet it’s full of diversity, culture and interesting people. My neighborhood is within walking distance of a downtown business district, where the food co-op, farmers’ market, French bakery, library and co-working space are located, yet we can easily drive to Chicago when we’re craving a bigger city. What do you want your life to look like? How does where you live affect how you live? If you’re not happy with that equation, what can you do about it? @MoJoJules So tomorrow I am doing a goal of sorts I said I would do as I started life over.All due to a new friend.Loving it. @jenluit Kids out of school today. Guy coming to install new floor. Kitchen exploded. On the other other hand, love having them here. @kt_writes late-afternoon autumn sun slanting over the rocking chairs on the front porch. @McMer314 I love that I still get excited over the little things, like a new book from the library or the leaves changing color. @MoJoJules buster is lovingly laying on my foot. I don’t want to shift to laying down cuz its such a sweet moment. I love him. @kt_writes I love watching my kids talk on the phone to my parents as much as I love listening to them. @TrinaMb Reading about others happiness makes me smile. @kt_writes J is several states away, but we just enjoyed happy hour together, via phone, sharing bits about our day & generally unwinding. What’s on your Love List? If you’re not on Twitter, feel free to share with the rest of us here! Kristin, John and I have been talking a lot about what we refer to as our “forever home” — a place we want to put down roots and hopefully only leave toes-up. For John, one of his fondest hopes is that it will be someplace profoundly beautiful. He would love to live on the ocean or on Lake Michigan, waking to the sun glinting off the water. I want to be that little old lady you see walking around town, going from farmers market to the bakery. Culture and lifestyle matters more to me than the terrain. But I think both of us are deeply aware that where you live affects how you live and like Goldilocks, we want to find the place that’s just right. It’s cool that you’ve realized the benefits of being right where you are. Thanks for highlighting one of my tweets, it was actually in response to what you wrote about watchin your children, cuz it really did make me smile to read about your happiness. I know I would tend to make the best of where ever I lived, but am so at peace with our locale in terms of it’s access to the outdoors and nature – real life givers for me. I once lived in an apartment in Amsterdam, with hardly a greeen space to be found, but, I found solice in the waterways and planter boxes I would pass. While I recognize their can be ‘draining’ places to live, I guess we would have to choose to look/seek a silver lining. Kristin — I’ve lived in my town for over thirty years now and still love it. What do I love? I love days like today when the sky is solid blue and the sun still warm on my skin. Oh, I love where I live. It was a lifetime dream for me to live on a boat, and I realized that. However, and this is the big however–the area I live in has been one of pleasure for me always, but the boat I chose to buy was with the promise of help from a friend who broke promises and kind of left me “stuck” with a huge project boat. I learned to love my boat for who I’ve become from living on her and working on her, and now she’s the “home” I’ve always wanted–one that is inviting and comforting to myself and my children as well as those around us. I consider the sky my ceiling, the ocean my floor, the neighboring hills my walls, and the local islands my backyard. Nature fills and sustains me–on my best days there is such an abundance I can effortlessly share. On my worst days, there are glorious sunrises/sunsets and if that’s all I ‘have” I am still very lucky:) But, it had to be a mindful choice to move forward and not let disappointment sour my experience. Colleen, I think you should move to Saugatuck or Traverse City, Michigan. :) I’m a Michigan native, so I’m a fan. But back to what you were *really* saying…it’s so great that you and John are not only aware of the connection between place and lifestyle in your minds, but you’ve also been talking about it as a couple. Just having that foundation will help a lot as you find the right place, also also make those inevitable compromises along the way. It’s a lot like looking for a life partner—it’s really helpful to know what’s important to you and what you’re looking for, but also to hold that dream list loosely and be open to characteristics you might end up loving that you never imagined. 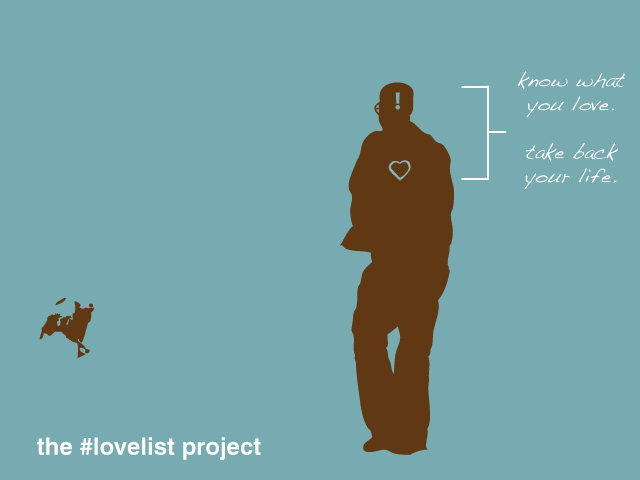 Sara, a Love List all about where you live and why you love it—perfect! I imagine that awareness about why you love your town really feeds your energy level and overall happiness. Kristin, my wife and I are past ready to set roots somewhere. Relationships and the growth of those relationships, it they with people, a neighborhood, a town etc. are important to us both. Unfortunately this round of graduate schools is naturally transitory and although we our hearts desire to plant the reality is our situation lends it self to uprooting. Despite this potential for movement, we love where we live – we are anomaly’s within the emerging adult demographic. Despite the reality this is a rural, overwhelmingly white, politically conservative, underdeveloped, broken, small, Midwestern town, we love where we live. It that is a beautiful thing. Although it is difficult, there is something true about pulling up roots and moving one. Struggling to pull up roots means that one had relationships that meant something, that one invested in the lives of those around them. All though it is never fun to feel the pain of pulling up roots, when one has to do so it is the symbol that something good has happened in that place. When we moved out of the suburbs into the country we stopped buying stuff we didn’t need. Plain and simple. We downsized and began saving money without so many stores nearby sending us sales fliers in the paper. Great thoughts here as always.